Christmas has come and passed. Kim and I have gotten close to calling the first floor unpacked, and have had a couple of guests over to check the place out. Still have some boxes down here to sort through, and a room full of boxes upstairs. 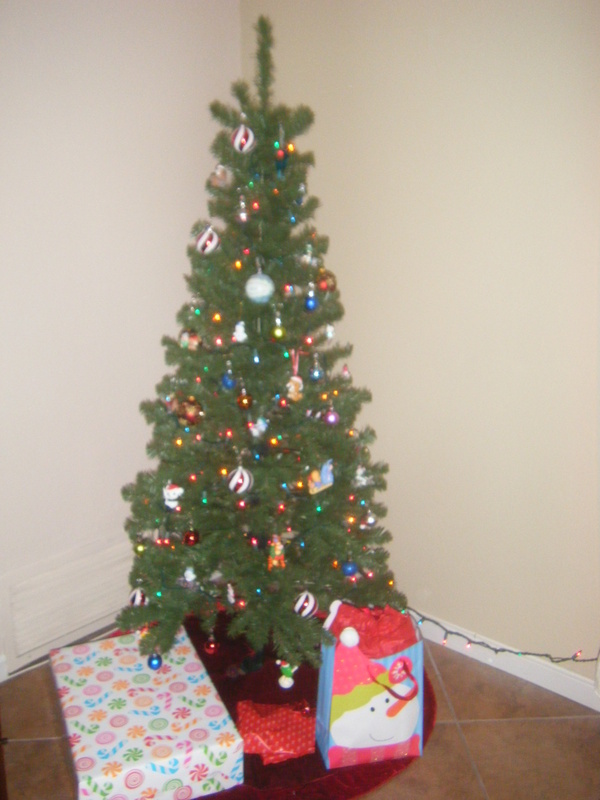 But, in the spirit of secular gift-giving, we spruced up the place a little bit and put up a pretty (fake) tree. We had a work party in the middle of the month, but I was forced to miss the family parties. After not getting sick for probably a year and a half, I got a cold on Christmas Eve Eve and it has carried through to now. Yesterday I felt well enough to at least be in people’s company and got to see Kim’s family for Christmas Part II and a few of my family members for dinner at my aunt’s restaurant. Hopefully I’ll be rearing to go with another night’s rest and can get through work just fine. This week, Kim and I will be looking at some venues for the wedding. We are still in the far off beginning stages, but need to at least figure out the basics (i.e. venue and date) since we’ll have some out-of-towners and the holiday-season. Hopefully we’ll fall in love with an inexpensive, easy-to-work-with venue that’s willing to be lax on house rules. We’ll see! I’ll update after the first few visits. This entry was posted in Holidays, Home and tagged Less Than Three. Bookmark the permalink.